The best gig the boys have ever performed. Loved the lighting and sound both were amazing. Crowd were awesome. Fantastic night. Great venue, superb band and hundreds of Uni students singing “oh Jeremy Corbyn”....... brilliant! Sundara Karma are the wondrous new indie band from Reading. Wild, fresh and exciting, the band boldly challenge a status quo of characterless bands and pointless pop. The euphoric four-piece group unites drummer Haydn Evans, guitarist Ally Baty, Oscar Lulu playing guitar and on lead vocals with Dom Cordell on bass. They have just announced an exciting headline gig taking place later in the year at Nottingham’s Rock City, O2 Victoria Warehouse at Manchester, O2 Academy Bristol, O2 Academy Sheffield, O2 Guildhall Southampton and O2 Academy Brixton in London during April 2019. Plus, they are part of the awesome line up for Leeds \ Reading Festival 2019 taking place at their respective sites from Friday 23rd to Sunday 25th of August. You can also see them join The Kooks at Community Festival, the big all dayer happening at Finsbury Park in London on Sunday 30th of June 2019. 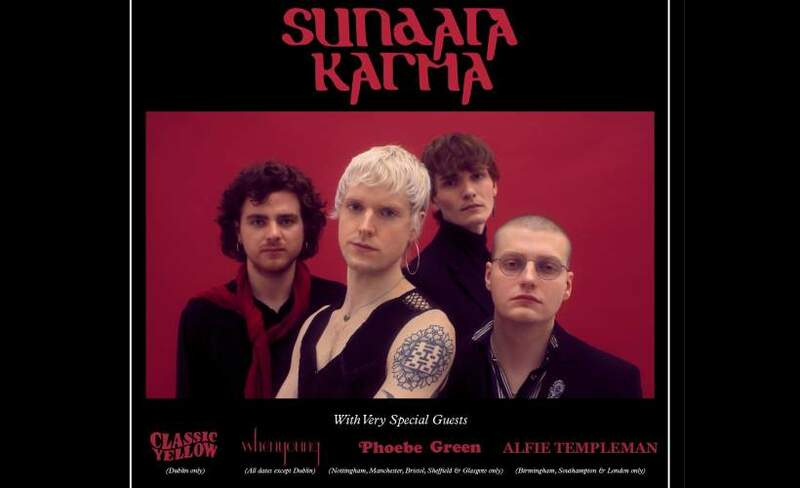 Sundara Karma tickets will sell quickly so make sure you grab yours before they are gone. Arena-ready rock anthems speak of wanderlust and the yearning to explore the world that awaits outside small town mundane minds and shallow prejudice. Burning bright with all the excitement of young romance, the new stars in making are ready to expand from cool indie band to become worldwide sensations. Their single Loveblood was announced by Annie Mac as her Hottest Record In The World and received prominent airplay through her on Radio 1. The new single’s release follows their massive hit single A Young Understanding. Make yourself ready for their release by setting a personal reminder through Gigantic to arrive to you via text message or email. Gigantic always has the very best gig tickets so stick with us!